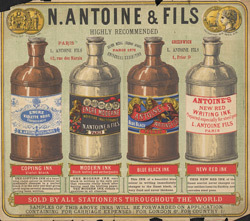 This is an advertisement for Antoine and Fils inks. During the 19th century there were many experiments in ink manufacturing and a number of formulas were developed for permanent inks. Advances in chemistry and the improved availability of dyes enabled coloured inks, like the red and blue black, to be developed. These dyes would fade over time if exposed to light and would smudge if not allowed to dry properly however they were a great improvement on previous inks that actually corroded the paper.